As I’m beginning this month’s article some nasty storms just ripped through Cleveland on the 11th. There were branches, trees, wires, power lines down, and road closures on the west side due to those hazards, including my QTH of Westlake. Luckily I’ve heard of no injuries. If you’re not part of the NWS Skywarn program, please consider joining as a spotter. Skywarn is a volunteer program that helps the local National Weather Service office know what’s happening on the ground and assists in warning people about dangerous weather conditions. Training typically happens in the early spring for spotters. Check with your local club or Skywarn organization. The Republican Nation Convention went off without major incident in Cleveland. I was working from home and had the scanner on most of that week. Three major trunked radio systems were utilized: MARCS, the new MARCS-IP (Multi-Agency Radio Communications System), and GCRCN (Greater Cleveland Radio Communications Network). If you didn’t set a wildcard or use UniTrunker to watch those systems, you probably missed a lot of the event communications. There were about 12 primary talk groups on GCRCN where most of the action took place. These were previously unidentified so they were not in any lists or databases that use Radio Reference. A wildcard stops on any talk group whereas programming specific talk groups into the scanner will only stop on transmissions for those talk groups. The “old” MARCS system was shut down immediately following the convention as it was kept online largely for backup. It has been replaced by the MARCS-IP system. One of our Technical Specialists, David KD8TWG, has been involved with setting up a DMR repeater in Cleveland. The frequency is 442.0875 (+5 MHz standard offset) using Color Code 1. 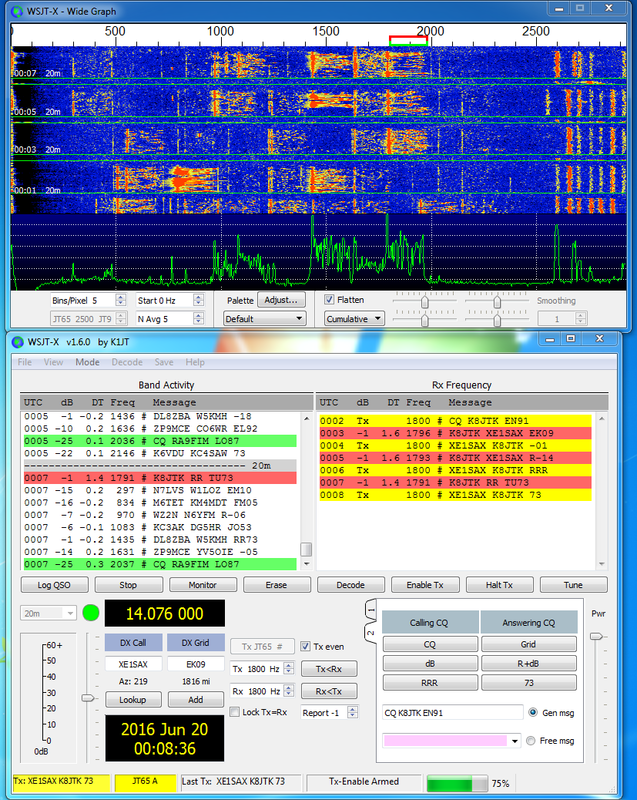 The repeater is connected to the K4USD cBridge (http://www.k4usd.org/). On that website is a listing of the “standard configuration” for repeaters connected to the bridge. Right now, your code plug should follow the layout listed on the site. A cBridge is a feature that allows interconnecting of repeaters over the Internet and a Color Code is equivalent to a PL tone or DCS on analog repeaters. When I picked up my DMR radio at Dayton, I found a code plug that had repeaters in Dayton and Columbus for the drive home. It was a nice opportunity to quickly get on the air with DMR but I kept threating myself to write my own. With the installation of the repeater in Cleveland, I took the opportunity to do just that. What is a “code plug?” Some history I found online notes the origins came from wire plugs, later jumpers, which were plugged into the radio to enable certain options or features. Since everything is now processor based, the term continues to stick with the radio world and is a fancy word for ‘radio configuration.’ It contains transmit/receive frequencies, tone selections, timeout values, IDs, configuration settings, etc. I used the one I found in Dayton as a reference. There is also a sample one on K4USD’s site for my radio. I compared the two and designed mine the way I thought worked best. Just because someone designed a code plug one way doesn’t mean you can’t modify or do it differently. It’s analogous to one ham’s memory channels are not the same as another. In the end, it took about 3 hours to make mine! Keep in mind that was a lot of learning and comparing, in addition I programmed all 65 possible talk groups so I don’t have to add them in later. From discussions on the air indications are it took others a few hours as well. But my code plug works! I couldn’t be happier. Well OK I could, apparently I’m just far enough away that my 5 watts doesn’t quite make the trip. I took the radio to work and tested it from there. I am writing an introductory series for the Wood County Amateur Radio Club on getting started in digital modes. The first few articles were for those who have never worked digital and want to upgrade their station. Remaining articles will focus on a specific mode. I’ve completed 3 so far (starting in February): an introduction, station setup, and working JT65/9. Published versions can be found at the club’s website in the CQ Chatter newsletter: http://wcarc.bgsu.edu/. As I point out in the second article, Technician class licensees can still participate. All of these sound card digital modes can be operated over FM simplex or even a net on a repeater using an HT! 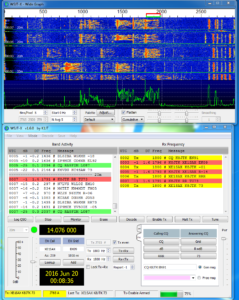 There are clear downsides like not being able to transmit as far as an HF station and occupying the full 10 to 15 kHz FM, even though the bandwidth of the audio generated by the computer is less. Yes, this defeats the purpose of narrow bandwidth modes. Someone wanting to learn and experiment with these modes may get bitten by the bug and lead to a license upgrade. That’s how I did it. I plan to write an article every 2-3 months. My dad and I had the opportunity to join the Toledo Mobile Radio Association (TMRA) on August 10. They had Chris Wilson N0CSW, National Sales Manager for Yaesu talk about their System Fusion. Chris did make it clear that the company was paying for travel so there would be some ‘sales pitches.’ The presentation was short but the program ended up being driven by the audience with a lengthy question and answer session. Some things I learned: the DR-2X repeater announced at Dayton is not going to be a replacement for the DR-1X, though they may have improved on some shortcomings. The 2X is more of a full featured repeater. It will have the ability to operate dual receive and dual transmit (but not at the same time) creating two repeaters from one unit. They are including voice messaging (like club meeting announcements). Mailboxes were users can record messages for others. This reminds me of the mailboxes repeaters used to have when autopatches were more prevalent. The 2X can monitor a separate control channel for commands. This repeater will not support WiresX but will have “MSRL” (Multi-Site Repeater Linking) via an add-on Ethernet port. Their linking technology will allow the repeater to be linked over any IP based network, including mesh. This brought to mind an interesting use-case where multiple low profile/portable repeaters could be linked at sites with mesh such as air ports, hospitals, and Red Cross shelters. 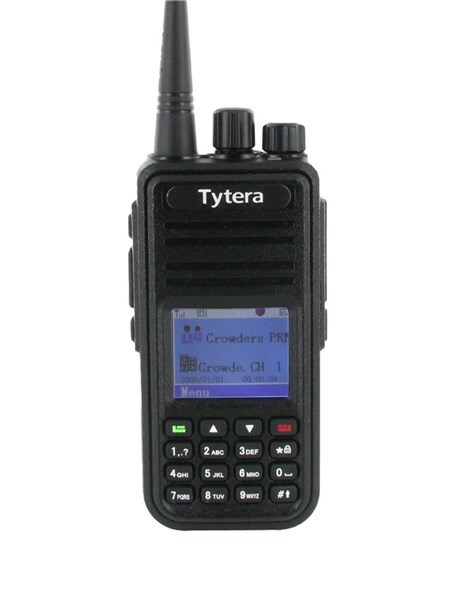 This would create a linked repeater system where not as many users would have to setup cross-banding or run to the other end of a hospital to reach a radio. In contrast, something similar can be done using the AllStar Linking system. At the meeting there was alot of: “I would like this feature/I don’t like this feature in the radio,” “we’re having this problem setting up the repeater to do X” kind of Q&A. My take away from that, their plan is to add features to radios by firmware update and not always release new radios. In addition to all the work David KD8TWG has been doing to get DMR up and running in Cleveland, he’s been helping repair and upgrade analog repeaters, and setting up APRS IGates around town. 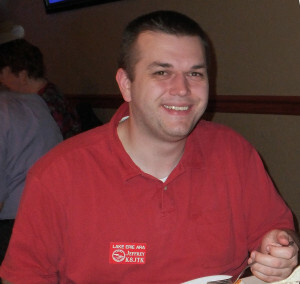 He will be giving a presentation on APRS at the Lake Erie Amateur Radio Association’s club meeting on August 30th. Dinner starts at 6:30pm with the meeting at 7:30, don’t need to have dinner to attend the presentation. Haven’t seen an official announcement on location yet but it’s expected to be at the Play Arcade in Mayfield Hts (5900 Mayfield Rd, Mayfield Heights, OH). Check the LEARA website for updates and for dinner reservations: http://www.leara.org/. I will be giving my introductory Raspberry Pi presentation at the Cuyahoga Amateur Radio Society meeting, September 13 at 7:30pm. It will be updated as there is new hardware and innovations available. Their meeting location is the Busch Funeral Home, 7501 Ridge Rd, Parma, Ohio. More: http://www.2cars.org/. This article appeared in the The Lake Erie Amateur Radio Association newsletter The Spirit of ’76 and ’88 June 2014 edition and The Wood County Amateur Radio Club newsletter CQ Chatter July 2014 edition. Read the rest of the series in the Dongle Bits articles category. We’re going to take a look at projects others have done with micro-computers and controllers. Many of these will be Amateur Radio related but I will highlight some getting started projects that show setup or basic programming. Since many Hams are into computers and programming, I will highlight some networking and server related uses. Finally, some of the more some crazy and unique setups I’ve come across. First thing to note: if you receive this newsletter in printed form, you’ll want to go to the club’s website or get it in electronic form to view these links. Links will be to videos or instructions posted online. Any YouTube videos will start at the beginning of the segment. Programming your first Arduino project. I was informed the University of Akron Amateur Radio Club (W8UPD) was planning on using the Raspberry Pi for their second High Altitude Balloon launch on April 8, 2014. Though no reason was given, it was scrapped for the Beaglebone Black board. They configured it to send back Slow-scan TV images overlaid with telemetry information. Unfortunately, the launch was a failure due to high winds and “poorly placed trees.” Upon launch, the payload got snagged and caught in a tree. I heard from John – N8MDP who setup his Raspberry Pi as a D-STAR hotspot as well. His setup works with the “X-Reflector” system. There are multiple D-STAR reflector systems that co-exist together on the network. His instructions are detailed and the setup is different than mine because different software is needed to access these alternative reflector systems. John installed a webserver on his Pi to control it from the Internet. PiIRLP. IRLP on the Pi. EchoLink (part 1) (part 2). Later they stated there are still issues. Stay tuned. TNC-Pi (part 1) (part 2) which comes as a kit to build. APRS was used in the demonstration. Mobile Xastir based APRS station. Repeater controller with web interface. This is still in development. DVAP Pi which I’ve mentioned previously. There is a DHAP (Digital HAM Access Point) which is a DVAP Pi in a hardened case. ID timer (part 1) (part 2) that will remind you to ID with your call sign every 10 minutes. Heads-up display in a mobile setup for radios that use CAT commands. One of the first projects I saw was how to use the Raspberry Pi as a Home theater PC. This allows you to watch videos, listen to audio, or display photos accessible via the network on a TV. 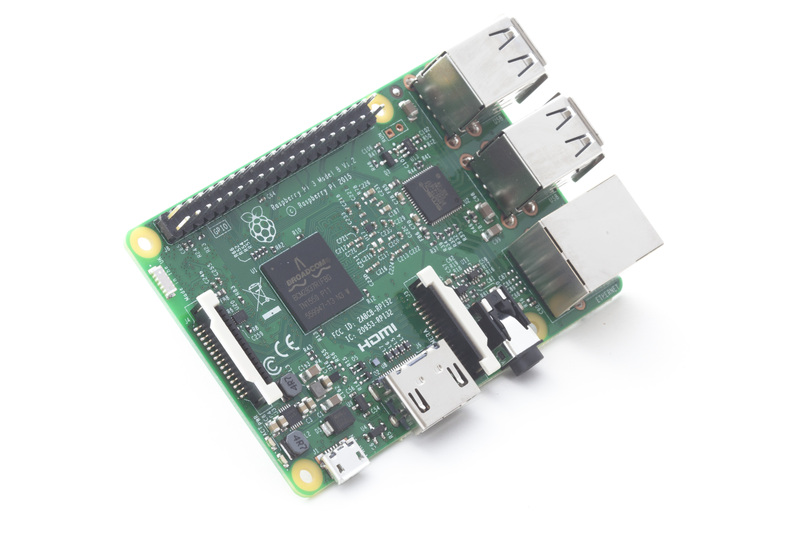 A Pi can be turned into a home or portable access device used in conferences, competitions, demonstrations, or school project. Some examples are a router, network attached storage (NAS) device, web server, or secure virtual private network (VPN) server. The VPN server uses OpenVPN, an excellent encryption package that offers trust no one (TNO) encryption since you generate the encryption keys. A useful project is the Raspberry Pi IP address IDer which speaks the IP address if you are operating headless and need to connect to it. Want to relive the 8-bit gaming days of the Commodore 64? There is a project called Commodore Pi to create a native Commodore 64 emulator and operating system for the Raspberry Pi. Build a coffee table gaming rig. 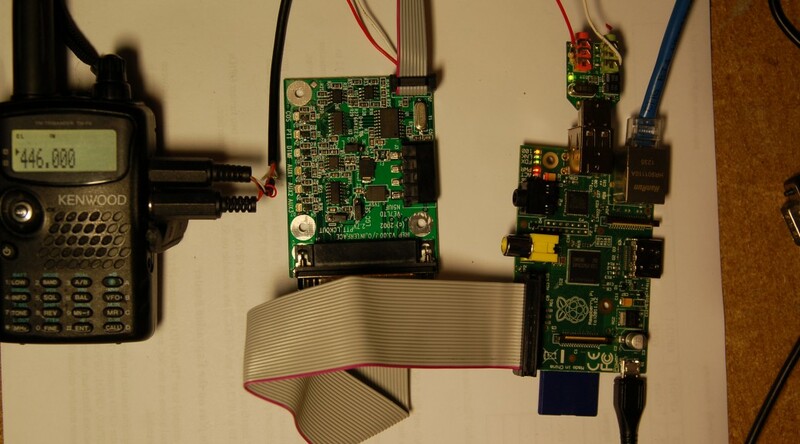 Turn a Raspberry Pi into an FM transmitter. If you like cheap phones, for $160 you can create your own Raspberry Pi smartphone. Want to give your dog a treat via email? The Judd Treat Machine will do just that! Send an email to the dog’s email address, it dispenses the treat, snaps a picture, and replies with the picture attached. The University of Southampton in England created the Raspberry Pi Supercomputer using 64 Raspberry Pi computers. They use a “message passing” system to distribute processing across all 64 devices. His son also helped out by building the rack to hold them out of… Legos! Next time, we’re going to move on to another type of dongle: the $20 software-defined radio.